Brian Rigling, chair of Electrical Engineering at Wright State and director of Sensor Systems Research at the Wright State Research Institute. The IEEE is the world’s largest association of technical professionals, with more than 400,000 members in chapters around the world. The IEEE Grade of Fellow is conferred by the IEEE Board of Directors upon a person with an outstanding record of accomplishments in any of the IEEE fields of interest. The total number selected in any one year cannot exceed one-tenth of 1 percent of the total voting membership. IEEE Fellow is the highest grade of membership and is bestowed upon a very limited number of senior members who have contributed importantly to the advancement or application of engineering, science and technology bringing significant value to society. A graduate of Fairfield High School, Rigling received degrees from the University of Dayton (B.S. in physics/computer science) and The Ohio State University (M.S. and Ph.D. in electrical engineering). He joined the faculty at Wright State in 2004, where he is now a professor and chair of the Department of Electrical Engineering. In 2015, the IEEE selected Rigling as the recipient of the IEEE AESS Fred Nathanson Memorial Radar Award “for outstanding contributions in radar imaging and adaptive waveform design.” The award recognized outstanding contributions to the radar art through technical papers, presentations, inventions or products by someone under the age of 40. Originally developed primarily as a defense technology, radar has emerged as a widely applicable sensor, with a growing presence in transportation, medicine, outer space and below-ground exploration. 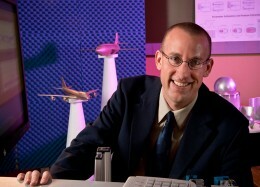 Rigling credits his collaborative relationship with radar experts in the Air Force Research Laboratory at Wright-Patterson Air Force Base and the broader radar research community.